Presently PP sheet is the most widely used industrial material in the world. PP sheet is heat, wear, impact and corrosion resistant. PP sheet is generally used for acid proof anti-corrosion sheds, cold storage partitions, dust free plant engineering, and special storage facilities. 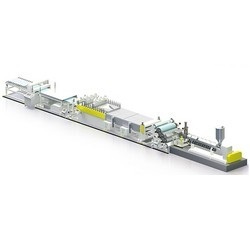 1.New design 2008, the Leader 800kg/hr high filler content variable corrugated PP sheet production line. 2.Comes with a fully automatic feed system with capacity to simultaneously measure 10 kinds of recycled materials, raw materials and additives, able to self adjust feed amounts according to production requirements, thereby reducing wasted raw materials. 3.High productivity twin screw extruder, automatic filtration system, gear measuring machine, and 45° calendar. 4.Triangular feed oven: Heat resistant to 450°C, multi-point temperature control ensures homogenous molding temperatures. 5.Adjustable calender rolls, optimal corrugation size control. 7.Compatible with fully auto cutting table/conveyor for neatly stacked product. Extruder Twin screw extruders are available in φ58/58mm~φ92/92mm according to customer preference.